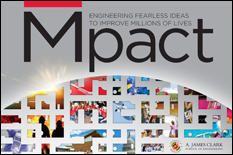 The University of Maryland's A. James Clark School of Engineering hosted its first Mpact Week, a four-day event that attracted more than a thousand attendees and hundreds of K-12 students to its College Park campus. The Mpact Week events, which took place October 23-26, 2013, showcased the Clark School's research, education, innovation, and entrepreneurial ecosystem. Highlights from the week included a Student Startup Showcase at Maryland Innovation Mpact, a captivating Whiting-Turner Lecture about surgical robotics by Simon DiMaio of Intuitive Surgical Inc. as part of the Fischell Festival, several hundred K-12 students in attendance at Maryland Robotics Day, and a celebration honoring Team Gamera, the Clark School's human-powered helicopter team. The Clark School also welcomed an ESPN and ABC film crew to capture footage of Maryland Robotics Day that aired on ESPN during the UMD homecoming football game vs. Clemson on October 26. Learn more about the Mpact Week events.